Courcelles sur Vesles, Picardy, France. It is rumoured that Jean Cocteau designed the staircase of this splendid chateau – interior design seemingly another string to his creative bow. It is also said that literary icons such as Racine, La Fontaine and Alexandre Dumas stayed here, too. Built during the late seventeenth century, Chateau de Courcelles offers fifteen rooms and three suites (larger ones being in converted outbuildings), a restaurant and bar. 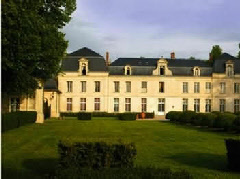 The property is located to the west of Reims and is within easy reach of Paris.